This June, there’s a new direct flight launching from Denver to San Luis Obispo! With the addition of this daily, nonstop flight, it’s the perfect time to plan your trip to sunny California whether you’re traveling for business or pleasure. Located halfway between San Francisco and Los Angeles, the Central Coast offers countless, bucket list experiences you won’t want to miss out on. Take advantage of the jaw-dropping scenery, local restaurants and hand crafted beer and wine awaiting you in San Luis Obispo! Now, discover 11 reasons why you should book your trip to SLO today. San Luis Obispo offers sunshine and warm weather year-round. With its perfect 75-degree weather, SLO is the ideal vacation spot whether you are seeking a relaxing getaway or adventure filled vacation. Cue the sound of crashing waves and sand between your toes! 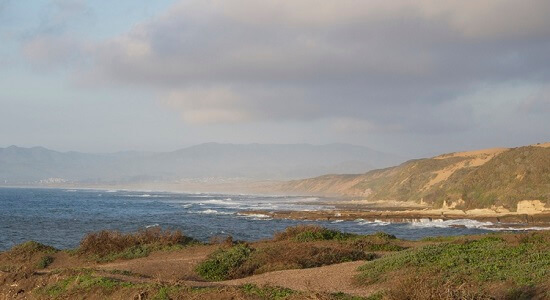 The Central Coast is lined with beautiful, picture perfect beaches, featuring hidden gems like Pirate’s Cove or well-known hot spots like Pismo and Avila Beach. Visitors can drive less than 15 minutes from Downtown San Luis Obispo and find themselves in an oasis of sun, sand and water. Check out at our top beaches along the Central Coast to visit during your trip. When visiting San Luis Obispo, you have limitless opportunities for outdoor adventures. Aside from the gorgeous hiking trails, there are several local surf spots, ATV excursions, horseback riding trails and more. If you’re feeling daring, soar and zipline across SLO County’s landscapes, overlooking beautiful wineries, parks and lakes. 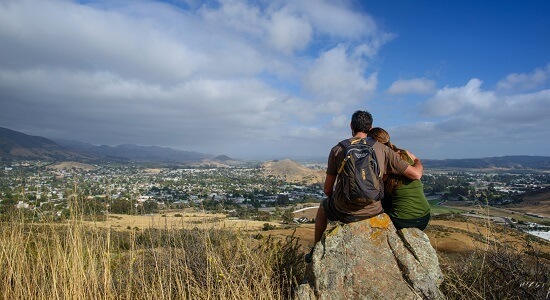 Hiking is a must when visiting San Luis Obispo with its breathtaking scenery and epic views. Each hiking trail offers its own treasure whether it’s panoramic views stretching all the way out to the Pacific Ocean or adventures through rolling hills and inland canyons. Explore our top hiking trails throughout San Luis Obispo today. Get ready for delicious eats and craft cocktails! San Luis Obispo’s restaurants are known for their local ingredients, exquisite dishes filled with flavor, down-to-earth atmosphere and friendly servers. With every bite of your farm-to-fork meals, you’ll get a taste of San Luis Obispo’s foodie scene and culture. Be sure to start your vacation on a Thursday because you won’t want to miss out on San Luis Obispo’s famous Thursday night Farmers’ Market. Every Thursday night, Downtown SLO transforms into a foodie and festive scene, blocking off the main street for a farmers’ market like no other. This community event features fresh produce, craft goods, the iconic Santa Maria style tri-tip sandwiches and live, local entertainment. Downtown San Luis Obispo is teeming with shopping, historic sites to see and laid back vibes. From boutiques, museums, art galleries and delicious restaurants, it’s guaranteed you’ll find a memento from SLO. 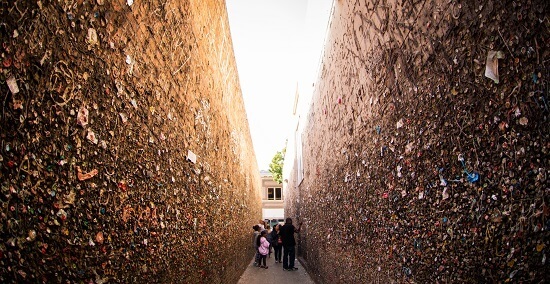 With the infamous Bubblegum Alley and the historic Mission San Luis Obispo De Tolosa, there are a variety of activities to choose from and epic photo ops within just a few short blocks. San Luis Obispo thrives with local artists ranging from jewelers and sculptures to painters and musicians. On the first Friday of every month, Art After Dark, an event of art and community, takes place throughout the galleries in Downtown SLO, allowing you to experience the arts first hand. Visit one of the many galleries and bring home a special souvenir! 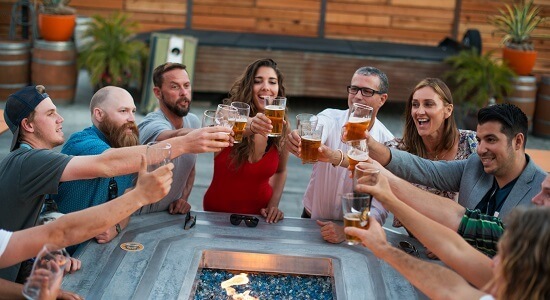 Whether you’re a beer lover or brew master, we highly recommend beer tasting at one of the countless craft breweries in San Luis Obispo. Our local breweries offer beer tours, tasting rooms, beirgartens, trivia nights, concerts and always a one-of-a-kind, chilled beverage. Check out the SLO craft beers worth planning a trip for, including Central Coast Brewery’s Blonde Chai Ale to the “Pacific Ocean Blue Gose” Wild Ale from Libertine Brewing Company. Edna Valley and San Luis Obispo’s wine country has over 20 wineries to choose from, producing California’s finest Pinot Noirs and Chardonnays. Each winery offers unique wines and beautiful, memorable landscapes. Begin plotting your wine tasting route today! About 30 minutes north of San Luis Obispo lies the internationally renowned Hearst Castle. With its rich history, stand out architecture and an array of scenic views that will take your breath away, we highly recommend booking a guided tour at Heart Castle, which are offered daily. Purchase your tickets ahead of time because tours sell out fast. In addition to Hearst Castle, there are a variety of hidden treasures and bucket list attractions along the Central Coast from Avila Beach, a picturesque beach town, to Morro Bay, known for the must-see Morro Rock, salt water taffy and clam chowder. Explore our day trip ideas including sites to see throughout the Central Coast. Now, it’s time for you to plan your trip and book your stay in San Luis Obispo! For more travel inspo, follow us on Instagram, Facebook and Twitter or sign up for our newsletter to hear the latest on San Luis Obispo.